A few years back, I was rudderless. I had no direction. I went to university and got my Master’s degree only because everyone else I knew was doing that. I bought a condo because it seemed like everyone else was as well. I worked full-time in a 9-5 job because everyone else was doing that. I was living some one else’s life, because I was too lazy to think for myself. I was also extremely lazy. I could have stayed that way, but the more I worked I moved through my days, unhappy with the way things were going, not ecstatic to be waking up everyday, seeing others living MY ideal life, I decided I needed to change. And every self-help guru told me it was me who had to change, if I wanted to see any change in my life. I decided to change one aspect of myself that was particularly low. I had to become more consistent in my ways. I started a billion things, but I gave them up after a few days, or weeks. I never stuck with something long enough to become an expert. I was always moving from task to task, from thing to thing, from hobby to hobby. I wanted to find two or three things that I wanted to do and do them consistently for years and years. I decided those three things would be meditation, yoga, and internet marketing. I didn’t choose these three things randomly. I wanted something that would help me be physically fit and mind-body connection, I wanted something that would help with my spirituality and self-awareness and I wanted something that would help me with abundance and prosperity. So these three items came to being. I decided I would do these three items consistently for at least 2 years without a break. So everyday, I would spend 30 minutes to an hour meditating, and 30 minutes to an hour on online business. Also, I would go to yoga 3 times a week. What did I learn from consistency? There are twelve things I have learned from consistency and I want to share those with you. The thing about consistency is that it will beat everyone eventually, because most people will give up after some time. If you can just beat everyone else who has given up, you will be a winner. Time in this case will be in your favour. Consistency ensured that my willpower wasn’t depleted. You see all of us start off the day with a certain amount of willpower. But with these three items, I was going to do them everyday or a certain number of times on specific days. There was no decision-making involved in it. This way I didn’t deplete my willpower thinking about what I was going to do, I just did it. Consistency made me gain big after a few months. Before consistency, I had given up on most items after a week or a month. With consistency, I stuck with these items for months (and hopefully years), and this way I was truly able to have big gains in them over time. I was able to become more of an expert rather than stay the amateur or beginner. Consistency helped me go the extra mile. Because I was so concerned about being consistent, I didn’t want to let go of missing even a single day (be it weekend or holidays). I went the extra mile and this way the people who were watching noticed me taking these extra steps. I got kudos and recognition from other meditators, business owners, and yogis for my persistence. I became well-known in my circles as a go-getter only because of consistency. Consistency helped me become more creative. 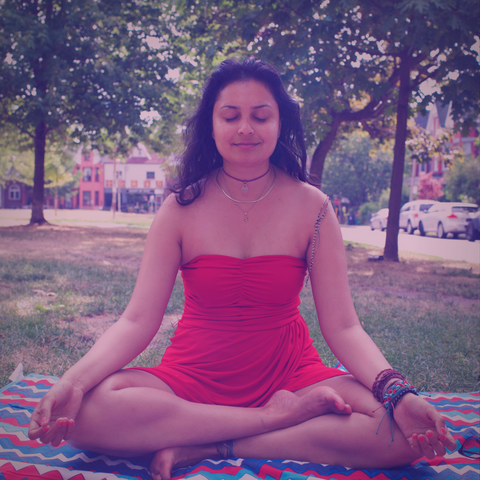 Sometimes life did come in the way, and then I had to think of ways that I could incorporate meditation, yoga, and online business into my daily routine despite the interruptions. I became really creative in incorporating these items into my life, by waking up in the middle of the night, or waking up early, or sitting in the hostel washroom to do the necessary work. The more consistent I was, the better I felt about myself. I saw how well I was doing with my three items, I could see the progress I was making in each, and it all gave me a huge confidence boost. I felt really good about myself, because for the first time, I could say that I am not a quitter. Consistency in these 3 items helped me with other tasks. The more I was consistent in these three items, the more it became a self-fulfilling prophecy in other endeavours. I became more consistent in all the tasks I undertook, because I was consistent in these three. My self-image changed to one of a consistent worker, something I would have never called myself before. Consistency changed my persona with my family and friends. People who know me really well and who knew I never finished anything, saw that I was being consistent with these three items, and their view of me improved drastically. Now they looked at me, and didn’t see a quitter, but a winner – someone who was working hard at changing her self-image and her reputation. Consistency improved my fitness levels, my business success, and my personal growth. This was an inevitability, but the more yoga, meditation, and online business work I did, the better I became at all three areas. I was slowly putting in the 10,000 hours (as Malcolm Gladwell says) and becoming an expert in these areas. So gratifying! Consistency translated into other areas of my life. I started keeping a cleaner house. I started waking up earlier. My relationships with my family and friends improved. I started loving myself more. And so on. Everything affects everything. Everything matters. Consistency helped me get rid of shame and guilt over the past. I had always been ashamed of my failures in my past, and they always stuck with me no matter what I did. But being consistent in these three items, helped me move past that guilt, as I was no longer that person in my eyes. I had moved past it to become someone more successful, someone who was consistent, someone who was an expert! Consistency helped me gain insight into who I was. I learned so much about myself from the experience of consistency. Those days when I wanted to quit, I would sit down with myself and figure out why I would quit, what was going on inside of me, and what was going on inside my head. I would analyze myself and I would learn more about myself and how I work. I have learned more about myself in the past few months of consistency than the previous 30 years of life. Consistency helped me become a better person overall. These three areas of my life might have improved. But I have become a better person overall. I give more money to charity. I care about the people around me. I am more empathetic. I pick up litter when I walk past it. It has affected me as a whole. We are not fragments. One aspect of ourselves affects the rest. These are twelve brilliant ways in which I have changed as a person due to ‘The Consistency Factor.’ I implore you to choose one or two items, and decide emphatically that you are going to stick with these items for at least one year (or more hopefully). Thanks for your comment. Join my free FB group in which we chat about ways to become time and location independent. Wow! This is the best ever motivational article I have ever came across. Thanks a million for this. It seems this was written especially for me. To thank you I’m going to put this in practice. I have fought inconsistency all of my life. I’ve already written my three topics that I’m going to start being consistent at all costs with. Thanks. William! I’m so glad to hear this.. I hope you will also consider joining the free FB group so you can be accountable to us and keep on charging ahead with all of your goals.. I’m so excited for you and your new life.